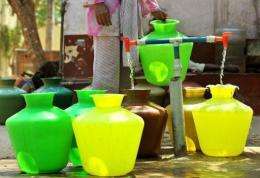 A woman collects drinking water in plastic pots from a community tap in Bangalore in March 2012. A rapidly worsening water shortage threatens to destabilize the planet and should be a top priority for the UN Security Council and world leaders, a panel of experts said in a report Monday. A rapidly worsening water shortage threatens to destabilize the planet and should be a top priority for the UN Security Council and world leaders, a panel of experts said in a report Monday. The world's diminishing water supply carries serious security, development and social risks, and could adversely affect global health, energy stores and food supplies, said the report titled "The Global Water Crisis: Addressing an Urgent Security Issue." The study was released by the InterAction Council (IAC), a group of 40 prominent former government leaders and heads of state, along with the United Nations University's Institute for Water, Environment and Health, and Canada's Walter and Duncan Gordon Foundation. "As some of these nations are already politically unstable, such crises may have regional repercussions that extend well beyond their political boundaries," said Norway's former Prime Minister Gro Harlem Brundtland, a member of the group. The Norwegian leader underscored that the danger is particularly acute in sub-Saharan Africa, western Asia and North Africa, where critical water shortages already exist. She added that water insecurity could wreak havoc "even in politically stable regions." Canada's former prime minister Jean Chretien meanwhile said it was impossible overstate the magnitude of the crisis. "The future political impact of water scarcity may be devastating," he told reporters in a telephone press conference. The report found that water demand in the world's two most populous countries, India and China, will exceed supplies in less than two decades. Experts said that some 3,800 cubic kilometers of fresh water are extracted from aquatic ecosystems around the world each year, largely as a result of global warming. Population growth meanwhile has worsened the strain on water resources. With about one billion more mouths to feed worldwide by 2025, global agriculture alone will require another 1,000 cubic kilometers (one trillion cubic meters) of water per year. "Using water the way we have in the past simply will not sustain humanity in future," Chretien said. "The IAC is calling on the United Nations Security Council to recognize water as one of the top security concerns facing the global community," he said. "Starting to manage water resources more effectively and efficiently now will enable humanity to better respond to today's problems and to the surprises and troubles we can expect in a warming world." The report is being released as foreign ministers of several countries prepare for a scheduled special discussion of the topic later this month on the margins of the UN General Assembly. UN-Water, a coordinating body for water-related efforts by all UN groups, also will told a meeting of experts in New York on September 25 to discuss ways to tackle the problem.